ON SUNDAY, the 14th day of April, 1878, three days ere the moon had reached the full, a band of Mexicans, Indians, and—from the testimony—a white man or two, crossed the Rio Grande from the State of Coahuila, in Mexico, and invaded Webb county, in the State of Texas—according to the testimony of Mr. Peter Steffian—at a crossing of the Rio Grande, near the foot of "Apache Hill," about forty-five miles north of the City of Laredo, and the Government Post, Fort McIntosh. These invaders, according to the affidavit of Captain E. N. Gray, of Concepcion, Duval county, Texas, are declared to be Kickapoo, Lipan and Seminole Indians, Mexicans and a white man. Their objects were murder and plunder. This declaration is supported by others in sworn statements. Their first acts were the killing of two "vaqueros," (cow-herders), in the employment of two well-known residents of Webb county, to say: Prospero Guerra and Justo Guerra. The killing was done in the vicinity of Apache Hill on the day of their entrance, to say: April 14th, 1878. From this point they took the main road which meanders down the Rio Grande, following its curves and bends, in the direction of Laredo—southeast—and about dusk, on the same day, they killed Jorgea Garcia, within hearing of his wife and friends, at his own rancho, about forty-five miles northwest of Laredo. His wounds were two rifle ball shots and stabs of a lance. An arrow was found near by him. His "chivarras," i. e., goat-skin leggins, his horse, saddle, etc., were stolen, and also his drove of gentle saddle horses, fastened near, were seized and driven off. His cry, "No mi mitan!" i. e., "Don't kill me!" was wasted on the air. None, if the savages could prevent, should live to tell of their presence in the country. They resumed their course down the Rio Grande until within fourteen miles of Laredo. Deeming this too dangerously near the Government post, Fort McIntosh, they changed their route, making an acute angle, and moved northeastward towards the Nueces river, passing by the ranchos, i. e., dwellings and circumjacent lands, in the vicinity of Dr. Henry Spoon's where they stole a sufficiency of horses to mount all of their party. Here, it appears from the testimony of Dr. Henry Spohn, began the rapid subdivisions and the quick concentrations of this corps, trained from youth to skillful maneuvering as the sine quo non of a predatory party. Simultaneously, and as if ended with ubiquity, they appeared at almost all the ranches in this vicinity. They selected the best horses and were then prepared for the raid. Their organization was perfect. They divided into minor parties and devastated in a wide sweep and again reunited at a signal, or by agreement, for consultation or defense. Hence, the accounts of those who saw the raiders at different localities conflict as to the number of the marauders. At this time they were near the Rancho de los Machos, in Webb county, and they were estimated to be from thirty to forty strong. At this locality they wounded Tomas Solis with two pistol balls and an arrow. Dr. Spohn attended and sent a small party to watch the raiders. This party followed them to Fort Ewell, in LaSalle county, formerly a Government post, on the Nueces river. Since leaving the Rio Grande, this predatory corps of cut-throats had traveled sixty miles in an air line. The verdure of spring had clothed the earth with grass; shrubs, bushes and trees were dressed in foliage; water ponds were filled; the people, in the main, were busy shearing their flocks. The time was demonically selected as propitious for such fell work. Few were abroad to note the progress of these raiders. The grass gave them abundant provender; and water, lately fallen, refreshed them everywhere. During the day the fruitful umbrage of the newly leaved trees screened them from observation, and the growing moon lighted their way by night. The party sent out by Dr. Spohn feared to make an attack and only gave the news of their departure to Fort Ewell. The marauders then roamed over the country at will. From Fort Ewell they followed the sharp bend which the Nueces river makes towards the east, in LaSalle county, and then turns to the northward in McMullen county, and on the 17th of April, at 9 a. m., reached William H. Steele's rancho—Palo Alto, i. e., High Tree—having traveled a distance of fifteen miles from Fort Ewell. From the testimony of Steele, Hart, Moore and Mrs. W. H. Steele—at that time Mrs. Taylor—we gather the facts of their operations. It is noted that they had a large drove of horses. These they had gathered on the 15th and 16th in Webb and LaSalle counties, since leaving the Rio Grande. In addition to bows and arrows it was found that they were well armed with rifles and pistols—doubtless, in the main, stolen from men whom they had murdered in route, though it is clear they brought some arms into the country with them. The entire band seems to have converged at this place. It has long been one of the chief objective points for the concentration of Indians when on frontier raids. Their exits are made, generally, from this vicinity, whether they take an upper or a lower line of departure. There should be—and this is the voice of all our people—a post here and a company of cavalry ready for instant service. Here, again, they were counted, and numbered about forty men. They were fiendishly exultant and unrepressed in their demonstrations of hellish joy. At Steele's rancho they held high carnival. They killed John Steele, a devoutly pious man, who deemed it wrong to carry arms. Mrs. Steele's two children, named Richard and George Taylor, and aged respectively eight and twelve years, were at first supposed to have been captured and carried off, but ere long were found murdered and their forms horribly mutilated and mangled with knives. Here, too, they killed Martin Martinez and Florentino Leo, and dangerously wounded Venturo Rodriguez with a rifle ball and eight arrows. In the midst of this, for their savage delectation, they stripped two Mexicans naked and compelled them to run foot races before them. Meantime, Mrs. Taylor, with wonderful coolness and motherly affection, waded across the river and escaped with her children. They were determined, by those who saw them here, to be Mexicans and Indians on a plundering expedition, murdering and stealing horses, arms, money, clothes, camp equipage, blankets, etc., from all the ranchos contiguous to this point. The intensely interesting statement of Mr. E. C. Moore gives an unvarnished account of the cruel hatred of the savages, the fiendishness of a white leader, the gallant defense and heroic death of Mr. Moore's companion and his own miraculous escape. The boys, cousins, having quietly resumed their journey, saw in the distance a cloud of dust which they judged to be raised by a whirlwind, but it was, in reality, a cloud of dust raised by a vast drove of horses which they had no suspicion was driven by Indians and their Mexican confreres. They met the vanguard of the party and, though not without apprehensions as to who they were, yet deemed them cow drivers. They fought retreating and one fell. He was the hope of a fond father. The affections of loving sisters centered in him. Alas! he left them in the wilds of San Ygnacio, on the edges of the Nueces Valley, only a grave and the rude inscription of his untimely death. From Fort Ewell the main course of the raiders was about southeast, and continued in that direction to the Toribio rancho, about four miles beyond Brown's rancho, thirty-six miles from Fort Ewell, in Duval county, not far from the line of McMullen, and about twelve miles from the Nueces river. In this vicinity they killed Vicente Robeldo, the chief shepherd of T. W. Gillette, and they stole or destroyed everything. One witness says that he lost four hundred dollars' worth from his camp alone. They wounded, and supposed they had killed, Tomas Zunega. Here they changed their course, and came to the Rancho Solidad, in Duval county, about noon on the 18th. At this point they were about thirty miles from San Diego, in Nueces county, at which town a company of U. S. Cavalry had arrived. At the Rancho Solidad they killed Guadalupe Basan, and gathered all the horse stock in the neighborhood. Soon afterwards they killed a shepherd and his wife. Their deaths are clearly reported by a little child. Their bodies were tied together, dead, and swung upon a horse, and which was turned loose. Their bodies have not yet been found. Subsequently they attacked Captain Richard Jordan's rancho, called Charco Escondido, i. e., Hidden Pond, and at 5 o'clock in the evening they killed his son, John Jordan, an excellent and exceedingly promising young man, just coming of age. But a short time previously he had written his fond mother and sister that if "God spared his life he would visit them soon." He, however, lived not to return, but, with his friend, Antonio Valdez, fell and died on his father's place. He is not, for life's cord was rudely snapped; but he sleeps the sleep of the good and the just. Mr. Frank Gravis resides in this vicinity. He was notified by his neighbors, and with great promptitude, busily moved here and there to assist to spread the alarm and to gather a party to follow the raiders. From the Munoz Rancho, at the request of Captain Jordan, about sunset, he sent a courier to the commanding officer of the U. S. troops at San Diego, through Judge James O. Luby, the county judge. With his small party, on the night of the 18th, he slept upon the trail, near Charco Escondido. The Mexicans and Indians lay close to him. From this point, early in the morning, he sent a second dispatch to the commanding officer at San Diego, stating which way the trail had gone. He took it at daylight, following with the jaded horses of the evening previous, which had served to bring his party together. The raiders met Margarito Rodriguez about ten miles west of Charco Escondido, and mortally wounded him. From him Gravis learned that a white man led the party, but whether a Mexican or an American he could not tell. This was early on the morning of the 19th, and in Encinal county. The Indians drove a large herd of horses before them. From Fort Ewell it was noted that they had their advance, center and rear guard. Many were identified as Kickapoo Indians. Again they divided into minor parties. One of these stopped a cart, destroyed its contents and stripped its drivers—two boys naked. This party immediately after, attacked a wagon train, and though reinforced by another, were driven off after killing a mule. Near here they shot and killed a shepherd and cast his body on the live coals of his campfire. Mr. Gravis hotly continued the pursuit, and from that point sent a courier to the commanding officer of the U. S. troops at Fort McIntosh, Laredo. The raiders, in small parties, now swept across the country and carried off all the desirable horses in their way. On the evening of the 19th, Mr. Gravis overtook the main body—again concentrated—as they converged together upon entering Webb county to cross the Rio Grande, distant then, about eighteen miles. They had been within fourteen miles of Fort Mcintosh; again they approached within twenty miles of it. They had passed within thirty miles of the U. S. Cavalry at San Diego, and at rio time during these six days had they been over sixty miles from a U. S.. Government post. Yet such is the extended character and sparsely settled condition of this district that such occurrences do take place and escape the notice of the military. Gravis charged gallantly. The prompt and daring reception which the Indians gave him frightened his Mexican allies and they retired. He continued the skirmish, but a reinforcement to the raiders compelled him to withdraw to the timber to prevent being surrounded and cut off. The raiders did not continue to follow, but pressed in hot haste to the Rio Grande, and strewed their trail with the clothing plundered on the route. Gravis had a wonderful race. More than a hundred miles had he ridden since he began to summon his party, twenty-four hours before. Such races are run and many heroic deeds performed by little parties such as his, and not much notice is taken of them. He waited patiently next day for assistance from Laredo. Some of his men reviewed the locality of the skirmish, and found several of the Indians' horses dead. Mr. Gravis saw the "cavallada," i. e., drove of horses, and judged it to number from one hundred and fifty to two hundred head. These were the choice horses of the country, for the weak and worthless fell by the wayside. During his return, on the 20th', he heard from parties from the neighboring ranchos, who had joined him on the trail, of many whom the raiders killed, but he has not mentioned their names. 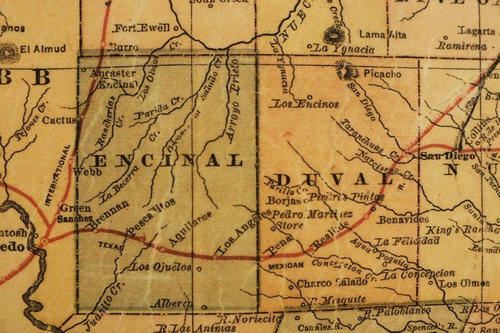 The whole party, intact, it seems, crossed the Rio Grande on the night of the 19th of April, twenty-five miles south of Laredo, in Webb county, at the Rancho Dolores, not far from the Zapata county line. They improvised rafts of dry wood called "tarrai," on which to float over their plunder, yet left provisions, clothing and moccasins on the river's bank. Here it appears, from Mr. Blucher's affidavit, they were again counted and numbered forty men. They were well armed with Spencer and Remington rifles, and their drove of extra horses certainly numbered one hundred head. Though Mr. Gravis' courier was sent to Laredo on the 19th, no movement took place from that point until 4 p. m., on the 20th. Such is the want of preparation, of instant readiness, which is absolutely necessary in this country for the defense of the people. This is but a brief resume of the evidence, coupled with some other known facts, and reduced to a crude narrative. The force and pith of the matter are found in, and touchingly stated by, the respective affidavits, and to these in conclusion, we now refer. 2. Two vaqueros in the employ of Justo Guerra and Prospero Guerra, at ''Apache Hill," Webb county, on April 14th, 1878. 3. Jorge,Garcia, near his rancho, Webb county, at dusk, April 14th, 1878. 4. A shepherd of Don Jesus Ramirez, at the Rancho Cerrito Prieto, Webb county, April 15th, 1878. 5. John Steele, at the Rancho Palo Alto, LaSalle county, 9 a. m., April 17th, 1878. 6. Richard Taylor, aged twelve years, at the Rancho Palo Alto, LaSalle county, 9 a.m., April 17th, 1878. 7. George Taylor, aged eight years, at the Rancho Palo Alto, LaSalle county, 9 a.m., April 17th, 1878. 8. Martin Martinez, at the Rancho Palo Alto, LaSalle county, 9 a. m., April 17th, 1878. 9. Florenzo Leo, at the Rancho Palo Alto, LaSalle county, 9 a.m., April 17th, 1878. 10. Frederick B. Moore, San Ygnacio, McMullen county, near the line of Duval, 3 p.m., April 17th, 1878. 11. Vicente Robeldo, Gillette's head shepherd, near Brown's rancho, Duval county, 4 p.m., April 17th, 1878. 12. Guadalupe Basan, Rancho Solidad, Duval county, 12 a.m., April 18th, 1878. 14. A Mexican shepherd and his wife, shot, tied together and thrown across a horse, near the Solidad Rancho„ Duval county, afternoon, April 18th, 1878. 15. John Jordan, Charco Escondido, Duval county, 5 p.m., April 18th, 1878. 16. Antonio Valdez, Charco Escondido, Duval county, 5 p.m., April 18th, 1878. 17. Margarito Rodriguez, ten miles west. of Charco Escondido, Encinal county, 6 a.m., April 19th, 1878. 18. Jose Ma. Canales, at Quijote a Gordos, 12 a.m., April 19th, 1878. They threw his body upon his campfire and his lower extremities were consumed. Others killed on the "range," reported by W. H. Steele. Others killed of whom J. W. Hart "had heard." Others killed, of whom F. Gravis makes mention on his return. Tomas Solis, who was attended by Dr. Henry Spohn. Venturo Rodriguez, at the Rancho Palo Alto. Tomas Zunega, at Brown's Rancho, Duval and McMullen counties. Two wounded men met by F. Gravis, April 21st. The above facts are supported by affidavits sworn to before U. S. Commissioners and other officials. For a very limited time! Get yours here.